JM Training: JusticeMakers 2012: Apply today! IBJ's 2012 JusticeMakers winners announced! Apply to become a JusticeMakers Fellow! JusticeMakers is a global community where the best and brightest agents of change in criminal justice and human rights reform come together to share ideas and innovate. Every year, JusticeMakers organizes a competition to support innovative projects run by defenders, human rights officers and public officials. We currently have 33 JusticeMakers Fellows in 25 countries. 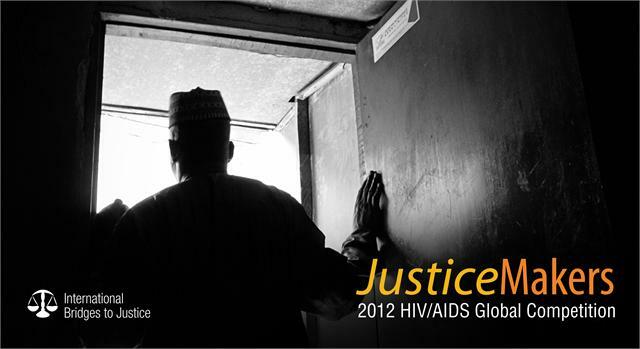 The 2012 JusticeMakers competition focuses on the advancement of legal reform to safeguard the human rights of those living with and vulnerable to HIV/AIDS within the criminal justice system. Prize: With the support of the LEVI STRAUSS FOUNDATION, International Bridges to Justice will select and train 12 JusticeMakers Fellows, who will be awarded $5,000 each to advance HIV/AIDS legal advocacy within the criminal justice system in their respective communities. Does your project concern the legal rights of those living with HIV/AIDS within the criminal justice system? Click here and apply before September 30, 2012. Forward this to your friends or family members who could be one of the next JusticeMakers fellows. Visit the JusticeMakers website now!